(Nanowerk News) Quantum logic spectroscopy – which is closely linked with the name of the 2012 Nobel prize laureate, David J. Wineland – has been significantly extended: this new method is called "photon-recoil spectroscopy" (PRS). The potential of this method has been demonstrated by the research group led by Piet Schmidt from the QUEST Institute, which is based at the Physikalisch-Technische Bundesanstalt, together with colleagues from Leibniz University Hannover. In contrast to the original quantum logic technique, the new method enables the investigation of very fast transitions in atoms or molecules. The results have been published in the current edition of Nature Communications ("Precision spectroscopy by photon-recoil signal amplification"). With this new method, spectroscopic investigations will be possible on nearly any kind of particles. The only condition is that they absorb just a few photons from a laser beam. This not only allows extremely accurate frequency measurements, but also increases the chances of finding discrepancies in observations of a possible change in the fine-structure constant. Furthermore, numerous other applications will arise, for instance in astronomy or chemistry. Piet Schmidt is a former colleague of David Wineland's. He worked in the research group of the Noble prize laureate for some time at the National Institute of Standards and Technology (NIST) (PTB's counterpart in the USA) and was involved in the development of quantum logic spectroscopy (QLS) there. At that time, the comparison of astronomic spectra and laboratory spectra had already indicated that the fine-structure constant may have changed. The significance of those measurements was, however, limited since the laboratory spectra of the metal ions were not sufficiently well known. "Since no sufficiently precise spectroscopic method existed for these ions at the time, I came up with the idea of photon-recoil spectroscopy (PRS) as an extension of quantum logic spectroscopy. This method allows a precise investigation of these ions", Schmidt says. "Similar to quantum logic spectroscopy, we capture the ion that we want to investigate in a trap together with an auxiliary ion", Yong Wan (the first author of the study) explains. The experiment was carried out in a sophisticated set-up consisting of a pair of two closely coupled ions – a calcium ion and a magnesium ion. The two ions repel each other due to their electric charge, but are kept together by the ion trap and are thus forced to do everything together, similar to a pair of twins. The researchers exploit this circumstance to obtain information on the ion they want to investigate (the spectroscopy ion, in their experiment, the calcium ion) by observing the behaviour of the easily controllable second ion (auxiliary or logic ion, in their case, the magnesium ion). Wan illustrates the principle as follows: "Just imagine a child sitting on a swing at rest. You throw the child a ball, and then more balls, each of them exactly at times when the swing is moving particularly fast. The swing is thus excited into very strong oscillations. This is exactly the same with laser light pulses when we direct them at our ion pair: if they have the suitable frequency, the photons are absorbed and cause the spectroscopy ion to oscillate due to the recoil kick. Because it is strongly coupled to the auxiliary ion, the latter also oscillates simultaneously." To stick to the image of the child: now two children are sitting on two swings next to each other, they hold onto each other and are unable to let go. "The auxiliary ion allows us to detect the oscillation of the spectroscopy ion very efficiently, since we can control the former very accurately and observe it – in contrast to the spectroscopy ion", Wan explains. The small signal of the spectroscopy ion is amplified via the auxiliary ion. "This makes our method much more sensitive than if we were to detect the photons themselves, as has mostly been the case with the previous spectroscopic techniques." Previously, thousands of photons had to be scattered by the ion to obtain a meaningful signal. "Our method requires merely ten photons to give the same signal", Florian Gebert (co-autor of the investigation) explains. After researchers from Innsbruck, Austria, showed in a similar experiment – a few months ago – that even single photons can be detected in this way, Schmidt's group has now demonstrated that quantum recoil spectroscopy is indeed very accurate. Hereby, the collaboration with Klemens Hammerer's group from Leibniz University Hannover was of central importance. "Thanks to their analytical model, systematic shifts of the observed signal could be accurately predicted", Schmidt says. In this way, Wan and his colleagues have measured the frequency of a certain transition in calcium to an accuracy of 88 kHz. Previous measurements were less precise by more than an order of magnitude. 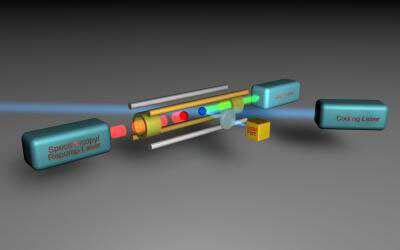 A special feature of the technique is its flexibility: "We only need to change the spectroscopy ion and to tune the spectroscopy laser to be able to investigate the next ion species. The auxiliary ion and the complex laser set-up it requires remain unchanged", Schmidt explains. His objective is – typical of PTB – to carry out absolute frequency measurements of many different ions with greatest possible precision. Contrary to the original quantum logic spectroscopy, the new technique allows the investigation of ions which remain in their excited state for a few micro- or even nano-seconds only. This considerably extends the range of applications accessible. Together with the greater sensitivity, this opens up new possibilities in the precision spectroscopy of molecular and metal ions which are found in space and are often used as reference by astronomers. This is good news, for example, for the researchers who compare ancient quasar light with "new" light in order to detect possible changes in the fine-structure constant. Technically speaking, these scientists do not investigate the light itself, but the characteristic spectra of the elements which are traversed by the light. These and further astronomic investigations will become more accurate thanks to Schmidt's measurements. "Our method is so versatile that a lot of other applications in astronomy or chemistry will come up", Schmidt expects.